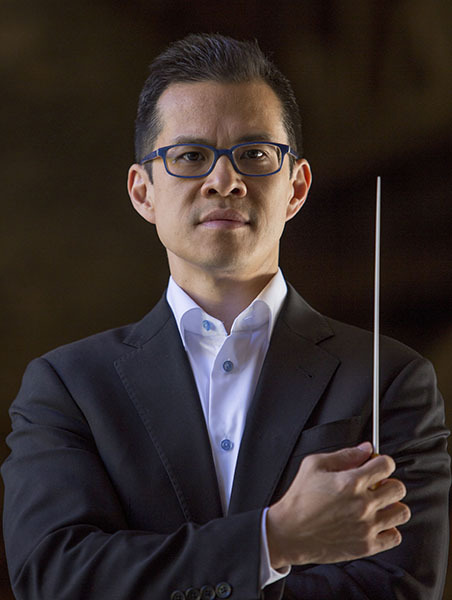 As a conductor, Mr. Chan is the Music Director of Camerata Notturna, a role he also serves in for The Montclair Orchestra, a New Jersey-based ensemble noted for its innovative and diverse programming. He has also directed l'Orchestre Dijon Bourgogne in France, and the festival orchestra of Musique et Vin, which consists of musicians from the Metropolitan Opera Orchestra, Berlin Philharmonic, and top orchestras in Paris. As conductor and educator, Mr. Chan works frequently with student orchestras at Juilliard and Mannes conservatories in New York, as well as the Pacific Music Festival in Sapporo, Japan. Mr. Chan's 2018-19 conducting schedule includes his Carnegie Hall debut, his debut with l'Orchestre Philharmonique Royal de Liège in Belgium, a return engagement with l'Orchestre Dijon Bourgogne, and various concerts in South America and Eastern Europe. In 2008, combining his love of wine with his passion for music, Mr. Chan co-founded the Musique et Vin au Clos Vougeot festival in the Burgundy region of France. As artistic director of the festival, which pairs wine tastings with musical offerings, Mr. Chan has overseen its growth from a small, intimate gathering to a two-week extravaganza that now attracts icons of classical music as its collaborators, including Yo-Yo Ma, Joyce DiDonato, Jean-Yves Thibaudet, Emmanuel Pahud, Menahem Pressler, and Cho-Liang Lin. A native of San Diego, Mr. Chan began his musical education at the age of four. He made his New York debut in 1995 at Avery Fisher Hall, and his Carnegie Hall debut in 2003. Mr. Chan received his bachelor's degree from Harvard University, and his master's degree from The Juilliard School. He is now on faculty at The Juilliard School and the Mannes School of Music, and resides in the New York City area with his wife, violinist Catherine Ro, and their children Annalise, Micah, and Arianna. David Chan is the concertmaster of the MET Orchestra in New York, a position he has held since 2000 as leader of that renowned ensemble. Widely recognized as a brilliant violinist and one of the leading musicians of his generation, Mr. Chan enjoys a diverse career as conductor, soloist, chamber musician, and teacher. His concerts have taken him to leading stages in North America, Europe, and Asia, appearing as soloist under the baton of such conductors as James Levine and Fabio Luisi. He is highly sought after as a chamber musician, performing regularly at the most prestigious summer festivals as well as throughout the New York City area.